This is a post I have been waiting to write for a long time. As you may know I live in a rental unit in San Francisco. It is a lovely old building. And I have been making small, slow improvements since I moved in. Not huge renovations....just lighting, painting, panelling. These things make a big difference, as you will see below. What I am currently focused on is the kitchen. After a small facelift I still am bothered by the countertops. I understand that these were quite popular back in the 70's :) I decided to speak with my landlord to see if I could replace them. I found beautiful oak butcher block at Ikea. (These have since been discontinued.....such a disappointment) They said that they would have to think about it. Here is what I started with and the improvements I have made thus far. (sorry for the poor quality of the below photo. It was the only one I could find). The cabinets and underneath the countertops were another thing that drove me nuts. I realized that painting wood like this was not going to yield a kitchen worthy of Country Living. But anything, I figured, was better than this. I also played around with color on the walls. For the purposes of this post I will show you the before, and the in progress photos. I wish I had a pic of the old lighting. Below is what it looks like today. I added mercury pendants and baskets above the cabinets for storage. I painted the cabinets, walls, and changed the hinges. The addition of the wainscoting, in my opinion, made a huge difference. Now back to the countertops. A few months ago I went on a short business trip. I returned to an apt resembling a hot sauna. The tap, faucet, (not sure what the correct name is) which brings the hot water into the washing machine had broken. I drove up to find all of the windows steamed up. As I entered I heard the distinct hissing sound of spewing water. It was so hot that I could barely touch it as I tried to turn it off. I don't know how long this had been going on. Somehow, though, the water stayed in the kitchen and drained to the garage below me. I am grateful every day that it did not ruin the hardwood floors, and everything in the apt. I call these photos the in process ones because there is a favorable outcome. It turns out that the water created mold at the base of the cabinets. Therefore the insurance company will pay to have new ones installed. And fortunately for me, that means new countertops as well!!! I am grateful to have such considerate landlords. Though I obviously need to stay within the budget, they have consulted me on what I want, and are making genuine efforts to create a kitchen that I will be happy with. The remodel begins on Friday. I will update you as soon as it is complete. That's great news! I guess the water problem was actually a blessing in disguise. YEA! Your patience has paid off. LOL I just got my wished-for new roof and a newly-painted front porch "thanks" to hail and wind damage. :-) Funny how things work out sometimes... Have fun picking out your countertops! I can't wait to see them. Great looking kitchen! 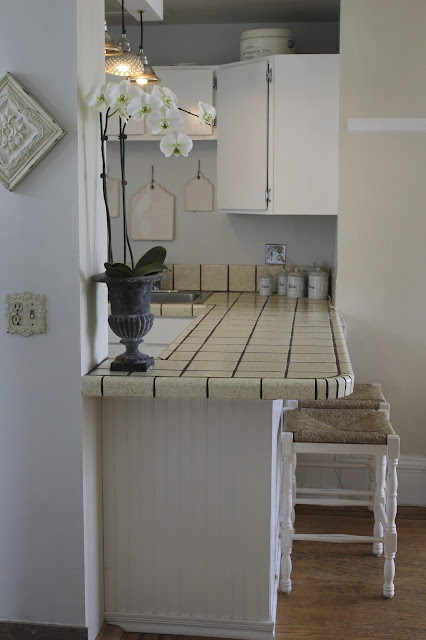 I've been browsing the internet for inspiration and ideas to start my own kitchen remodel. I already have my table picked out and I plan to go look at double oven ranges tomorrow. What is the most durable and cost-effective counter top material, in your opinion? I love how you made similar color choices pop with the way you layered them together. The white of the cabinets against the light blue of the wall worked well and didn't blend into each other. 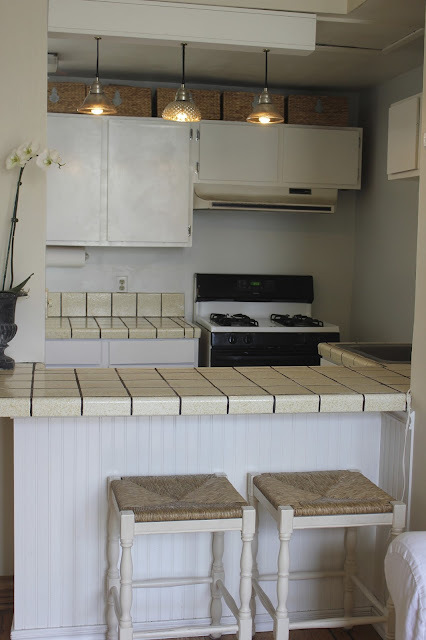 The same goes for the counters, as the tiles gave the color a depth that worked well with the rest of the kitchen. Lets not forget that great feminine touch you gave with the white orchids, trust me they were not lost in your design.